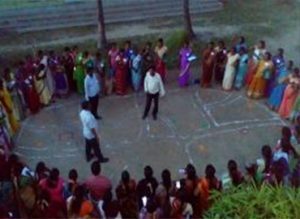 A Refresher Workshop on Community Approaches to Sanitation (CAS) was facilitated by Feedback Foundation from 21-23 May, 2018at Krishnagiri, Tamil Nadu. This workshop was organized by the Department of Rural Development &Panchayati Raj and UNICEF and was attended by 86 Master Trainers and Motivators from 5 Districts of Tamil Nadu selected by the State. The workshop aimed at providing a refresher training to the state pool of resources through building their capacity on CAS to augment and accelerate the implementation of SBM (G) in the districts.